Even our Presidents & other leaders believe in UFOs. Not sure if UfOs from other worlds really exist? Has someone ever called you a fool because you say you have seen one or believe in them? Well, even some of our Presidents, many world leaders, many astronaunts, & many airline pilots have stated their belief in them. Of all the U.S. Presidents, Reagan more than any other President, appeared to be obsessed with the flying saucer topic. Billy Cox, a feature writer with Florida Today, wrote a major story in Florida Today about Reagan. The article looked at a series of alien remarks that had appeared in a number of Reagan's speeches. Cox described the situation as "Ronald Reagan’s abiding fascination with extraterrestrials." Ronald Reagan’s daughter Patti Davis described her father as "fascinated with stories about unidentified flying objects and the possibility of life on other worlds. President Reagan may have gained this intense interest from sightings he had while he was Governor of California. Kitty Kelly in her Unauthorized Biography of Nancy Reagan stated Reagan admitted to believing in flying saucers, and "even swore that he had seen a few unidentified flying objects. "Two of these UFO encounters have become public. The first sighting story was made public by Steve Allen on his WNEW-AM radio show in New York. Allen stated that a well know personality in the entertainment industry had confided a UFO story to him many years before. As the story had already made the rounds in the rumor mill, there was no question the comedian and host was referring to Ronald Reagan and his wife Nancy. didn’t know what it was. The UFO went from a normal cruise speed to a fantastic speed instantly. If you give an airplane power it will accelerate - but not like a hotrod, and that is what this was like. We didn’t file a report on the object because for a long time they considered you a nut if you saw a UFO. Paynter added the UFO incident didn’t stop there. He stated that he and Reagan had discussed their UFO sighting "from time to time" in the years following the incident. references to UFOs in Egyptian hieroglyphics. Reagan was telling his story in a very animated way. This led Miller to conclude that Reagan seriously believed in UFOs. He asked him, "Governor, are you telling me that you saw a UFO?" Suddenly, according to Miller, Reagan realized that he was talking to a reporter. "This look crossed his face," recalled Miller, "and he said let’s just say that I’m an agnostic." these items would appear in Reagan speeches. In a February 11, 1988 speech called, Remarks at the Annual Conservative Political Action Conference Dinner Reagan was able to get both ghosts and UFOs in the same speech. president—and to “ride out” an administration’s tenure with regards to certain issues—and it appears that UFO dossiers may be on that list of things being withheld from our highest elected officials. to establish credibility regarding UFOs and to produce the greatest possible enlightenment on this subject. Dr. James McDonald Professor of Atmospheric Sciences, Quoted in "UFOs - a Scientific debate"
"In my official status, I cannot comment on ET contact. However, personally, I can assure you, we are not alone!" "They frequently saw them (UFOs) and then told me, I'm positive that there were three crashes by 1952". General Vasily Alexeyev Russian Air Force -Space Communications Centre. "They came up with a table of pictures of all the shapes of UFOs that have ever been recorded -about fifty ...The study of UFOs may reveal some new forms of energy to us,or at least bring us closer to a solution." "Of course it is possible that UFO's really do contain aliens as many people believe, and the Government is hushing it up." "Let there be no doubt. Alien technology harvested from the infamous saucer crash in Roswell, N.Mex., in July 1947 led directly to the development of the integrated circuit chip, laser and fiber optic technologies, Particle beams, Electromagnetic propulsion systems, Depleted uranium projectiles, Stealth capabilities, and many others! How do I know? I was in charge! (A matter of public record)I think the kids on this planet are wise to the truth, and I think we ought to give it to them. I think they deserve it." "With control of the universe at stake, a crash program is imperative.We produced the A-bomb, under the huge Manhattan Project, in an amazingly short time. The needs, the urgency today are even greater. The Air Force should end UFO secrecy, give the facts to scientists,the public, to Congress. Once the people realize the truth, they would back, even demand a crash program...for this is one race we dare not lose." "All Apollo and Gemini flights were followed, both at a distance and sometimes also quite closely, by space vehicles of extraterrestrial origin - flying saucers, or UFOs, if you want to call them by that name. Every time it occurred, the astronauts informed Mission Control, who then ordered absolute silence." "We all know that UFOs are real. All we need to ask is where do they come from, and what do they want?" Tombaugh and his wife claimed to have witnessed a UFO from their back yard. Will Smith, Actor/Musician: Smith claims to have seen a UFO while driving with a friend. Muhammed Ali: "If you look into the sky in the early morning you see them playing tag between the stars." Monsignor Corrado : "We can no longer think... is it true? Is it not true? Are they truths or are they lies--if we believe or if we don't believe--no! There are already numerous considerations which make the existence of these beings into a certainty we cannot doubt." Father Balducci, a Vatican theologian "close to the pope", who has been charged with studying reports of UFOs sent in from Vatican embassies around the world. This quote comes from one of Father Balducci's many recent appearances on Italian television. David Bowie, Singer/Musician: "They came over so regularly we could time them. Sometimes they stood still, other times they moved so fast it was hard to keep a steady eye on them." credible people have reported things that are impossible by our understanding of physics." an interview on the Art Bell show. Joe Firmage, Founder of USWeb: "We have objects in the sky. . .they have been spotted millions of times worldwide" Joe also claims to have had a face-to-face encounter with an extra-terrestrial. John Lennon: "It looked like a flattened cone with a brilliant light on top." -May Pang, assistant to John Lennon, describing the object they allegedly saw from Lennon's balcony in NY City. Dennis Weaver, Actor appearing in many westerns: "I think there's alot of evidence that we've made contact." American southwest (Roswell, New Mexico, anyone?). The alien tour was held at Homestead Air Force Base in Florida. According to his wife, Gleason was taken to an unmarked building where he saw four embalmed bodies. Gleason became one of the world’s leading collectors on UFO information and several of his friends confirm that the story was true. anything until an interview with Bill Knell, a UFO expert, in 1973. Hendrix also believed in life on other solar systems and that they had no interest in war with us. That could be a lot of LSD talking, but Hendrix gave a concert in Maui, Hawaii, just a few weeks before his death on July 30, 1970. During the concert - which was performed on the rim of a live volcano, several people - including Hendrix - reported seeing UFOs flying overhead. The radio stations were called and people actually filmed the occurrence. Dan Aykroyd, famous for "Ghostbusters" movies, & his Crystal Skull vodka :– He is fascinated by UFOs. He once hosted a television program devoted to it and is known to support UFO research organisations such as MUFON (www.mufon.com). He made a DVD documentary called "Dan Aykroyd Unplugged On UFOs", he speaks quite candidly about his views on the subject. positivethoughtshypnosis.com/the-pharaohs-of-ancient-egypt-were-alien-hybrids-new-genetic-study-suggests/ - Were the ancient Egyptians actually hybrids? This site gives scientific evidence that this may actually be the case. ​ascendingstarseed.wordpress.com/2016/10/09/proof-of-aliens-in-ancient-egyptian-hieroglyphs-relics-hidden-in-rockefeller-museum/ - Extremely interesting site showing pics of ancient hieroglyphics of grey type aliens & spaceships, & even a sphinx that resembles a grey. io9.gizmodo.com/who-built-these-structures-could-it-be-aliens-1276521709 - Who built the Nazca Lines, the pyramids, & so many other ancient structures that can't be explained? www.wisdom-square.com/mummified-alien-discovered-in-egypt.html - Mummified aliens found at Giza. In the Vedic literature of India, there are many descriptions of flying machines that are generally called vimanas. Perhaps the most disturbing and challenging, information about these allegedly mythical Vimanas in the ancient records is that there are some matter-of-fact records, describing how to build one. In their way, the instructions are quite precise. In the Sanskrit Samaraanganasutraadhaara it is written: Strong and durable must the body of the Vimana be made, like a great flying bird of light material. Inside one must put the mercury engine with its iron heating apparatus underneath. By means of the power latent in the mercury which sets the driving whirlwind in motion, a man sitting inside may travel a great distance in the sky. The movements of the Vimana are such that it can vertically ascend, vertically descend, move slanting forwards and backwards. With the help of the machines human beings can fly in the air and heavenly beings can come down to earth. The Hakatha (Laws of the Babylonians) states quite unambiguously: The privilege of operating a flying machine is great. The knowledge of flight is among the most ancient of our inheritances. A gift from ‘those from upon high’. We received it from them as a means of saving many lives. http://www.history.com/videos/ufo-sightings-early-written-accounts#ufo-sightings-early-written-accounts - A must watch video. This has fascinating facts of UFOs in ancient history which even includes famous people such as Alexander the Great. http://www.youtube.com/watch?v=MtFRlrPPVOY&noredirect=1 - Another good video, part of it repeats info found on the link above, but also many updated accounts as well. http://www.youtube.com/watch?v=2mHe211mLV0&feature=related - Video of ancient technology. http://www.youtube.com/watch?v=8c84yO5izAI&feature=related - Interesting video from the History Channel about a possible star gate in Peru. http://www.youtube.com/watch?v=e5l3Qh2vl-0&feature=related - Several news stations report UFO sightings. http://www.youtube.com/watch?v=kopk-tS9X3E&feature=related - This is a 1 1/2 hour documentory full of good info including clips from astronauts. http://www.youtube.com/watch?v=TFL3X4lhcaU&feature=related - Another great History Channel documentary about ancient aircraft. http://www.youtube.com/watch?v=FYsZNLZdC2s&feature=related - How were the pyramids & other ancient sites built? Do they contain Alien proof? Documentary from the History Channel. http://www.disclose.tv/news/russias_secret_book_and_alien_races_on_earth/136453 - Description of known star being races. https://www.halloweencostumes.com/ufo-history-and-folklore.html - Lots of interesting historical information about UFO's. Thank you goes to Justin for this great suggestion. Can UFOs be found in the Bible? Was Ezekiel's wheel a ufo? How would an ancient person describe what he saw? What about Moses & the pillar of a cloud? Many ufo sightings have claimed that the "ship" was hidden in a strange cloud. And what about the pillar of fire by night? How would ancient people describe lights but as fire. Night time ufo reports almost always include seeing bright lights. I am not going to come out & say that these are indeed ufos, but it does raise some interesting questions. I will leave you to research this in greater detail for yourself. Also, keep in mind that it's popular belief that there is not just one alien race, but many. Some of these are believed to be extremely bad, while others are believed to be of no harm. The Crucifixion of Christ painted by an unknown artist is in Visoki Dečani Monastery, Serbia. 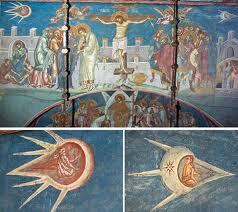 The fresco was painted in the year 1350. There appears to be flying crafts which should be highly unusual for a 14th century painting, since supposedly flight had not been discovered yet. The painting even shows that there is someone inside the crafts. This painting the Miracle of the Snow, was painted between 1428 and 1432 by Masolino da Panicale for the church of Santa Maria Maggiore, Rome. It has since been moved the National Gallery of Capodimonte, Naples. This painting commemorates the foundation of the Santa Maria Maggiore in the center of Rome. Legend has it that between the 4th and the 5th of August of 352, Pope Liberius and Giovanni, who was a rich Roman gentleman, had a dream of Mother Mary asking them to build a church devoted to her on the Esquilino hill, one of the famous Seven Hills of Rome. He said that Mary also told them that it would snow at the chosen location of where they were to build the church. Generally, snow is very rare in Rome even in the coldest seasons, yet the following morning a rectangle of snow was discovered on the Esquilino hill during the hottest month of the Roman Summer. Of course it was regarded as a miracle. People crowded to see the area of snow, which persisted despite the heat. As soon as the plot for the building had been staked out, the snow melted, and the first major church in honor of Mary, was built there in Rome. maintain that this is why Masolino’s clouds are not depicted like normal clouds, lacking any vaporous contours, but are all clearly delineated, almost disc-like in their appearance. This picture shows a UFO sighting over Hamburg, Germany from November 4th 1697. The objects were described as "two glowing wheels". This brings to mind the Biblical "Ezekial's wheel" found in chapter one, which is believed by many to actually be a description of a ufo. I'm not saying either way, but do find the evidence interesting. You may use your own judgement concerning this. This painting was done by flemish artist Aert De Gelder and is titled "The Baptism of Christ" It was painted in 1710 and is in the Fitzwilliam Musuem, Cambridge. 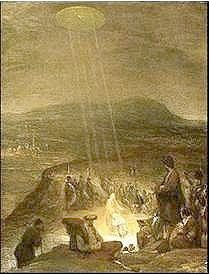 It shows a disk shaped object shining beams of light down on John the Baptist and Jesus. Angels hair is a strange (usually) white substance that is stringy & hair or cob web like in appearance & said to be dispersed from UFOs as they fly overhead. It's said to evaporate very quicklywhen touched, & while rare, it has still been associated with several UFO reports as well as some sightings of the Virgin Mary such as the Miracle Of Fatima on Sept & Oct 13th 1917. In Ohio 1954 - At 3:15 p.m. a cigar-shaped object with portholes maneuvered in the sky over a school in Marysville, Ohio accompanied by many smaller discs. It was witnessed by 60 students of Jerome Elementary School and teachers Rodney Warrick and Mrs. George Dittmar, as well as thousands of witnesses at an afternoon high school football game. The silver cigar-shaped object traveled at high speed, and wafted a blanket of a web-like material, commonly referred to as "angel hair," which fell to the ground over a three mile area. The UFO flew off quickly in a westward direction. Within minutes of touching the substance it would disappear, leaving a green stain on the fingers. (Sources: Marysville (OH) Journal-Tribune, October 25, 1954 & July 22, 1958; Leonard H. Stringfield, CRIFO News, December 1954, p. 5; Thomas M. Olsen, The Reference to Outstanding UFO Reports, case 59; Richard F. Haines, Project Delta: A Study of Multiple UFO, p. 185). 1. A close up sighting/encounter with a UFO. 3. Dreams of UFO or alien encounter, or being aboard a craft. 4. Strong emotional reaction to UFO or aliens (either attraction, revulsion, or fear). 7. Unexplained injury or healing. 9. History of UFO activity in the family. It has been found that abductions are usually found through generations of a family. On February 5, 1993 a rural family living near West Alexandria in Preble County had a UFO sighting experience. It was after 8:15 PM when, husband Charles, a diesel mechanic, and wife Sharon, an office manager, sighted four different size white and yellow/orange lights to the south of their farm house. The lights hovered over a woods about 800 feet from the house for almost two hours, moving both horizontally and vertically over this period of time. The lights slowly moved to the northeast before they disappeared. Sharon saw the lights first and ran to get her husband who was working in their barn. Sharon stated that she was "totally amazed, scared, and excited" by the event. A small propeller driven plane passed over the area during the sighting. On April 10 around 10:30 PM, a similar sighting occurred. Looking out of the door of the house she was staying in Betty R., a realtor, cashier, and office worker, sighted three bright lights to the south "bobbing" over a nearby woods. The objects would go down below the tree line and then back up into the sky. They would move clockwise for a while and then hover again. She watched these objects for a while when she noticed that a fourth had appeared. Around a half after this the objects left the area in different directions, to the north, the northeast, and the northwest. Her experience lasted for about one hour.